Welcome to Energy Vendor IQ! We’re happy that you’re interested in being listed in our directory. Please fill out the form below and we’ll add your listing as soon as we can. 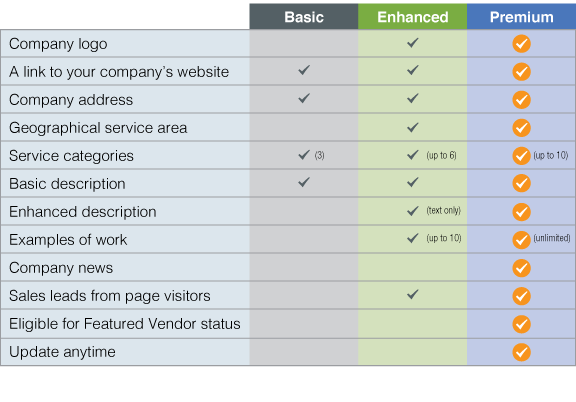 And check out our listing levels to see what purchasing an enhanced or premium listing can do for you! Let's start by choosing a listing level, then give us some basic information about your company. What does your company do? Give us a short (600 characters, including spaces) description. What should Energy Vendor IQ users search on to find you? Select up to 3 service categories that best represent the type of work your company does. Who should we contact if we have questions about this listing? All of our listings include home office location. What address should we list for your company?